If you’re thinking of selling your diamond ring, whether it’s engagement, wedding or just a special occasion ring – you have found the best place! With NYC Bullion, we will help you sell your ring in no time and you will be sure to smile when you get the best cash for jewelry quote in town! Diamond or sapphire, gold or platinum, if you have a precious ring you’ve decided to sell, visit our store in the heart of NYC – the Diamond District– and our certified professional gemologists and jewelers will give you a free appraisal of your precious assets. Among many jewelry buyers in NYC, we are one of the few that guarantee you will be fully satisfied by a pleasant customer service experience and will leave our store with an incredible cash payout in your pocket. So, don’t hesitate anymore – if you want to sell a ring, stop by NYC Bullion and let our experts authenticate your precious ring in no time! Or, if you want to sell a ring online, simply complete the “Get an offer now” form and we’ll send you the quote through email. 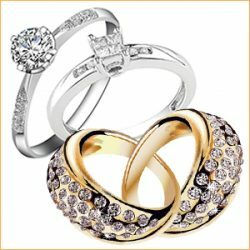 Where to Sell Your Rings? Wondering “Where can I sell my rings?” – You no longer have to think about it. Searching for the best place to sell diamond jewelry can be a quite difficult job, particularly if selling diamond rings - but we’ve got you covered! NYC Bullion jewelry experts are here to assist you with a free appraisal and guidance if you decide to sell a gold ring, diamond ring, platinum ring or any ring made of precious metals or stones. Stop visiting unreliable pawnshops or local jewelers – you risk ending up receiving a highly undervalued quote. At NYC Bullion, our professional associates use only official certified scales and specialized knowledge to ensure they assess your precious ring at its actual value. We guarantee you will receive a personal, honest and safe experience if you decide to sell your ring. Stop by at our store and get a cash for jewelry offer you cannot refuse. Searching for how to sell your rings? With NYC Bullion, you’ll get all the information you need. Whether you’re thinking about selling a ring online or getting a face-to-face assessment – you have come to the right place. To sell an engagement ring online, you just need to fill in the “Get an offer now” form and you will receive your personal quote through email in no time! Or, if you prefer a personal experience, visit our store in the Diamond District. Our top-notch staff of certified gemologists and jewelers will happily assess your ring for free, right in front of you, to give you an accurate authentication of its true value. Once you know how much it’s worth, you can easily make an informed decision and we assure you will get the best cash for jewelry offer in town! When it comes to selling diamond ring, you should be completely sure that you are dealing with a trustworthy diamond grader and buyer. Typical pawnshops and local jewelry shops don’t have the necessary expertise to offer you a great cash payout for your diamond rings. With NYC Bullion, you can feel secure and confident your diamond ring is in expert hands and that you will receive a fair, yet generous offer. Visit us in the Diamond District Area and get a free appraisal of your diamond ring today! Without a doubt, if you decide to sell your wedding ring, it can be an emotional process. More than that, pawnshops will try to convince you to give up your precious ring at very low prices – but you don’t have to do that. Here at NYC Bullion, we will help you by providing a free appraisal of your wedding ring and the best cash payout offer on the market. So stop by at our store in Diamond District and enjoy the most pleasant, safe and fair customer experience when selling your wedding ring. We know that selling an engagement ring can be a hard thing to do. Don’t visit unreliable pawnshops anymore – we ensure you that here, at NYC Bullion, you will get the most comfortable, safe and honest experience in town. Our professional team of jewelry experts will evaluate your engagement ring right in front of you, so you can be completely sure you have all the information you need when you decide to sell it. Come to the Diamond District and get your free appraisal and superb cash payout today!